Wedding etiquette can be a touchy subject. Today’s brides comb the internet for tips on how to not offend the guests but still have the wedding day they’ve always dreamed of.. Let’s face it, we’re all a little quirky and basic wedding rules can help guide us (and our crazy family) in our wedding planning. Here are a few tips to help keep the crazy down and wonderful memories happening. Rule #1 is to know the culture of your guests. Etiquette varies widely from coast to coast, and family to family. Planning an East Coast wedding will probably mean including details such as seating arrangements and traditional ceremony details, but perhaps not letting Fido the Dog be your ring bearer. West Coast weddings tend to be more laid back and casual. Here you might let Fido walk you down the aisle and guests might bring the food, a la potluck! Your wedding day should reflect who you are as a couple, so feel free to include the details and quirks you want, but not at the expense of making your guests feel uncomfortable or offended. Navigating what is appropriate wedding attire can be confusing for guests. Most of us know we should dress up for a wedding but what does that mean? Skirt and blouse? Floor length dress? Suit and tie? Cargo shorts and t-shirt? As mentioned above, asses the culture of the wedding. 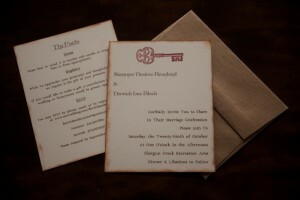 The invitations or venue might give guests a clue. A safe bet is arriving at a wedding looking more dressed up than normal, but not so much that you’ll outshine the bride or the wedding party. Floor length sparkly dress with stilettos? Probably not. Nice skirts and sweater? That’s a safe bet. With this being said, brides & grooms, it is OK to politely mention in your invitations the type of attire that would be most appropriate to wear, especially if it is an outdoor wedding and people might need to wear a sweater or jacket. As an invitation designer, one of the common questions I get is in regards to registries. How many places should we register for? Can we ask for cash only? Can we request no gifts? To these questions I usually ask how well the bride and groom know their guests and what are their real needs as a couple starting a new life together. Generally speaking, a couple should register for 2-3 stores and include that information on an invitation. Many would consider it rude or demanding to request cash, however, if you know your family and guests would love to support you both in the way you most need it, then it’s totally appropriate to (tactfully) include the needs or wants you both have. Did you know wedding invitations should be sent out at least 2 months prior to your wedding date? This is the number one biggest shocker for my clients. Ordering and sending out invitations is no last minute task. Often times, designers require a bride to order her invitations at least 6 months in advance of the wedding. You’ll want to send your invites out 2 months in advance is for several reasons. First, your guests deserve to know when your wedding is. Advance notice gives them a chance to clear their schedules and save the date. Secondly, it’s typical to request RSVP’s to be sent back one month prior to the wedding. This helps you know how many people to plan for. How many people RSVP you might ask? Well that depends on the region and your audience. West coast weddings tend to be more casual and laid back than their East coast cousins, so you will often find West coast weddings get far less response while East coast weddings expect an RSVP from everyone. Bottom line is, your wedding is your day, make it how you want. Celebrate being who you both are as a couple and be as creative or traditional as you’d like. With that being said, you don’t ever want to make a guest at your wedding feel uncomfortable. Be aware of your guests, and have a blast making your special day truly yours! this weblog on regular basis to get updated from hottest information.